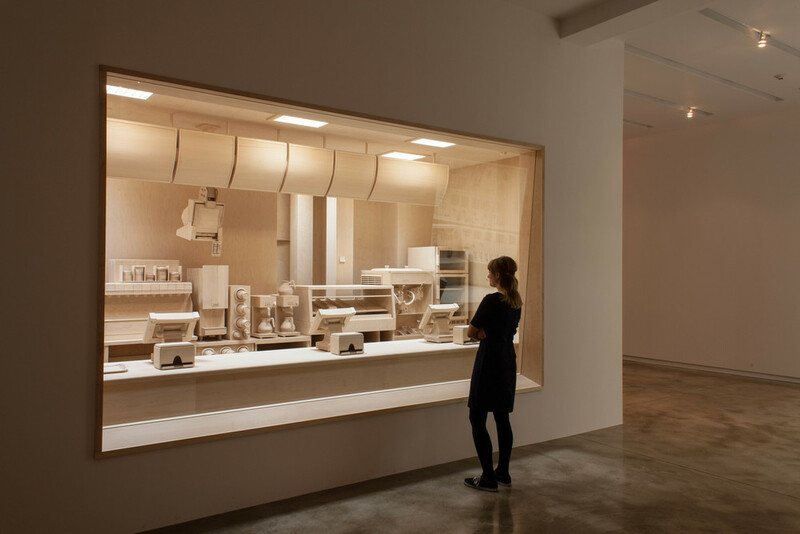 Roxy Paine has turned away from the pursuits and themes that have brought him global attention and respect. He has left the language of natural form seen through industrial eyes, he has left his exploration of the automated mechanics or mark making and art object production to approach the human figure, the body surrounded by cultural apparatus. He is looking into our mechanical extensions, massive, technological apparatuses that extend our most basic functions – our senses. Paine has, however, preserved his traditional approach of relentless labor – just as he painstakingly manufactured fields of flowers and mushrooms he has not simply documented the superstructure extensions of the body, he is building them flawlessly from raw wood, piece by piece, every exacting detail in a one-to-one reflection of the world we have constructed around us as enhancements. “Carcass” is a confrontational title, evocative of the gruesome corporeality of food sources that have no place in the fast food restaurant counter he has carved. Surreptitiously documented with a cellphone, as if the mechanics of a fast food joint are as clandestine and sensitive to exploitation as the airport security checkpoint he is building now, the space includes every package, container and surface required to deliver sustenance in its most highly commoditized state. This is a machine for delivering consumption culture – its every portion and package maximized for marketing impact and cost efficiency – it is the most perfect desiring machine we have been able to create. It is a manifestation of universal language, it can be found anywhere in the world, and it can thrive as an outlet of commerce. It is food divorced from the primary purpose of nourishment, it has been subsumed to the construction of elaborate meaning through a global symbolic language. It matters far less how well it feeds your body than how much it satisfies your mental preconditioning for its reception. Paine has erased all of the essential signs – color, language, image, that make the machine function across disparate cultures and locations. He has laid bare the physical means of delivering on a language of desire. Here’s how we give the people what they want, in the real world, by packaging and pressing buttons and delivering at speed with efficiency and regularity. This is a land that makes a promise and keeps it again and again and again – the assembly line of eating, not like in a prison or institutional setting where there is no option, this is the manifestation of the pinnacle of choice. All over the world people choose to walk in and be processed by this machine – it has been micro-engineered to satisfy many standards: the customer’s standard for satisfaction, the company’s standard for profitability, the franchisee’s standard for local function, the employee’s standard for labor. 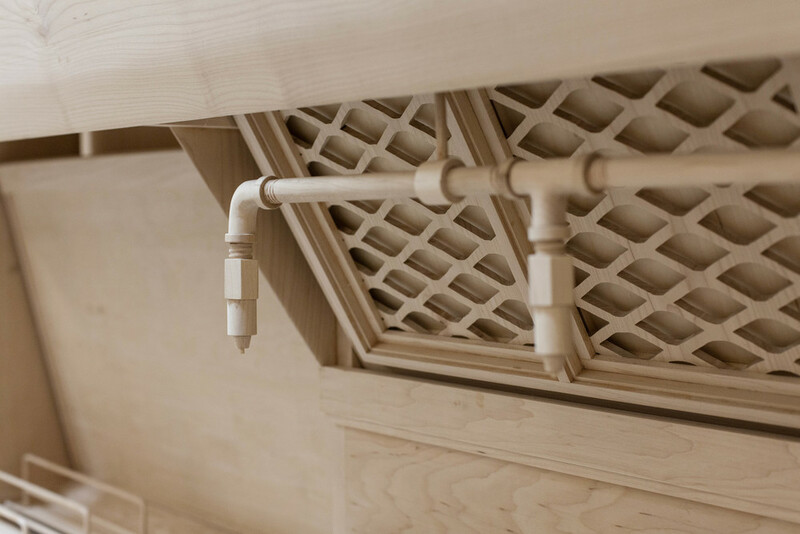 Paine has built it in wood, a primary material that would fail to perform to the standards of the global feeding machine. It is not fast enough, efficient or hygienic enough. Yet he builds it in the context of art, and places it in a gallery, two constructs that run contrary to the original. First, here, as art, it is meant to be seen, studied, examined. Though it lacks every calculated detail to draw attention to it that the original leverages: color, luster, finish, we can revel in the detail that is the exact replica of an original that we would never look at. We can marvel at the elaboration of the familiar yet unseen, the universal yet invisible – when we are in a McDonald’s we don’t look at it, except to verify cleanliness. It does not serve a visual purpose except as an armature for signage and messaging. It is not meant to last, just to work, and then to be updated, ripped out and replaced with little notice or fanfare, in order to keep the machine running. 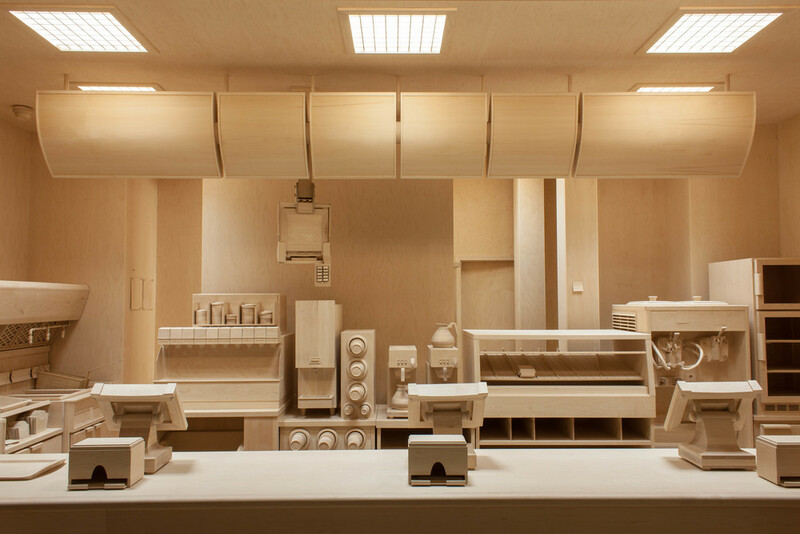 By carving it from wood it is taken out of its cycle of manufacturing food and desire, but it points to another level of consumption, that of the artwork itself. It replaces the desire for the most basic human need, sustenance, delivered as seamless product, for that of the most elevated and individual product, the artwork, similarly earnest in its pursuit of desire – the artwork goes after value with the same relentless, insidious assertiveness, but a mechanism and language entirely separate.